Dr. Zuhair Fathallah, assistant professor of plastic surgery at Basrah Medical College, will speak at Northwestern College’s Christ Chapel on Monday, Sept. 30, at 10:05 a.m. He will speak about the challenge of the church’s mission in Iraq in a time of conflict. The chapel service is free and open to the public. In addition to being a consultant plastic surgeon at Basrah Teaching Hospital, Fathallah is the lay leader of the Protestant Church in Basrah, whose founding was part of the Reformed Church in America’s pioneering mission outreach to the Arabian Gulf. 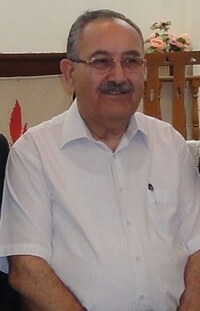 He has been a member of the council of the National Evangelical Presbyterian Church in Basrah since 1994 and has been pastoring the church since 2004. Fathallah has been involved in several mission projects in the community. He worked to reopen the church’s kindergarten, which now has 225 children, and they have a Christian radio station that has been approved by the central and local governments. The church also sponsors a free pharmacy. “My vision is to expand the school to become a primary school, the church to become bigger and strong, and to be able to distribute the Bible freely and openly,” Fathallah said. Fathallah is coming to Northwestern via the Presbyterian Peacemaking program. Arranged through the denominational offices of the Presbyterian Church (U.S.A.) in Louisville, Ky., the program invites leaders from partner churches around the world to share their experiences as peacemakers in their lands.